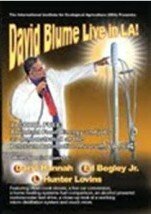 DVD - David Blume Live in LA! A two-hour bonanza of information about the business opportunities for and uses of appropriate-scale alcohol fuel. See David Blume give a riveting 2-hour-and-40-minute presentation about alcohol fuel. Permaculture helps people turn wastelands into food forests. 112 minutes - Color - Grade Level: 7-12, College, Adult.